Daily Illuminator: Advance Copies Of Revolution! 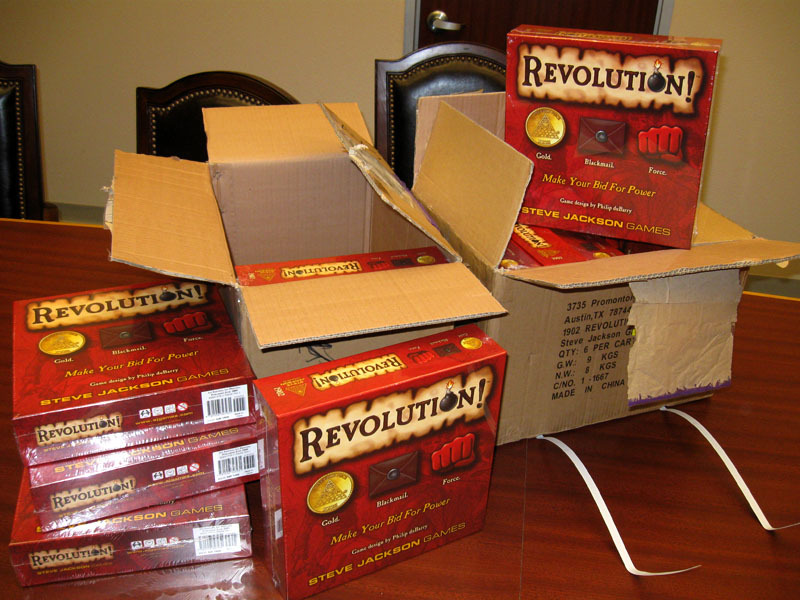 June 20, 2009: Advance Copies Of Revolution! The printer sent us advance copies of Revolution! and yesterday, the boxes got to us. It was like Christmas in June: torn open taped boxes, violently discarded packing material, and gleeful grins as everyone grabbed a copy. We didn't get to keep them, of course. But it was great to hold real live copies, hot off the press. These advance copies are destined for MIBs around the world. They'll teach the game to anyone and everyone, in preparation of the game's release this August. Of course, playing in a demo won't teach the guts of the game to everyone. Some people -- like me, for instance -- need to read the rules. Honestly, if I don't, I might as well chose my moves at random. Luckily for folks like us, there's a PDF on the Revolution! webpage that covers everything. This one is quite different for Steve Jackson Games, in nearly all aspects, except the one element that remains constant: it's a great game. If you have a chance, check it out.